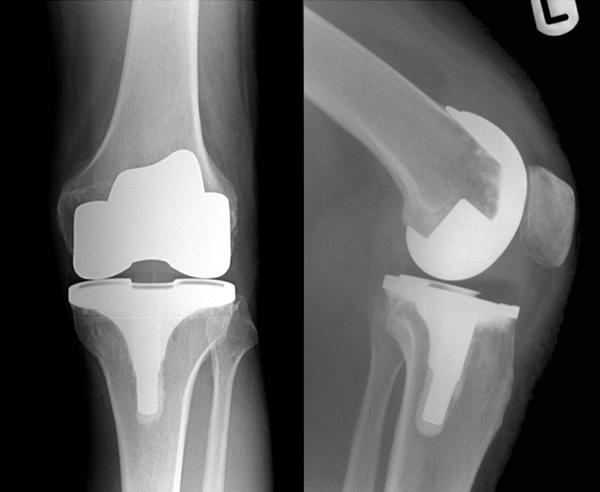 Total Knee Replacement (TKR) became popular during the 1970’s and 1980’s as a treatment for end-stage degeneration of the knee joint. Since then, many advances have been made. Today, almost 60,000 TKRs are performed in the UK each year. A Total Knee Replacement operation replaces the bottom end of the femur (thighbone) and the top end of the tibia (shinbone) with a prosthesis (man-made joint). Often, the patella (kneecap) must also have its back surface replaced. 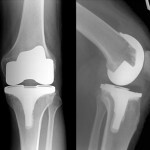 Recent advances in knee replacement surgery use Patient Mtched Techniques whereby pre-operative x-rays and scans permit accurate modelling of the patient’s knee. This allows more accurate placing of the implants and more rapid recovery. It may also reduce the risk of complications and improve longevity of the knee replacement. Andy Langdown uses the Visionaire system developed by Smith & Nephew for his patients. 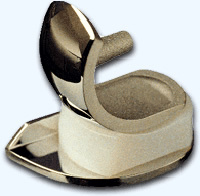 There are many different knee replacements available. The majority consist of metal components that are fixed to the bottom end of the femur (femoral component) and top end of the tibia (tibial component); a plastic liner is inserted between the two. In some designs this plastic liner is mobile. Most knee replacements are designed to be used with orthopaedic cement, which acts as a grout. Others are designed to encourage bone growth onto the prosthesis to give long term stability (uncemented). It is the plastic liner that wears out with time, probably related to activity levels. Technological advances, however, have produced bearing surfaces which can withstand higher activity levels and will probably last much longer. For example the Genesis II™ knee replacement made by Smith & Nephew has a femoral component made of Oxinium™ which has been shown in laboratory studies to reduce the wear on the plastic liner by 90%. Patients who are young and physically active may therefore benefit from technologies such as Oxinium™ since the risk of implant failure is significantly reduced. 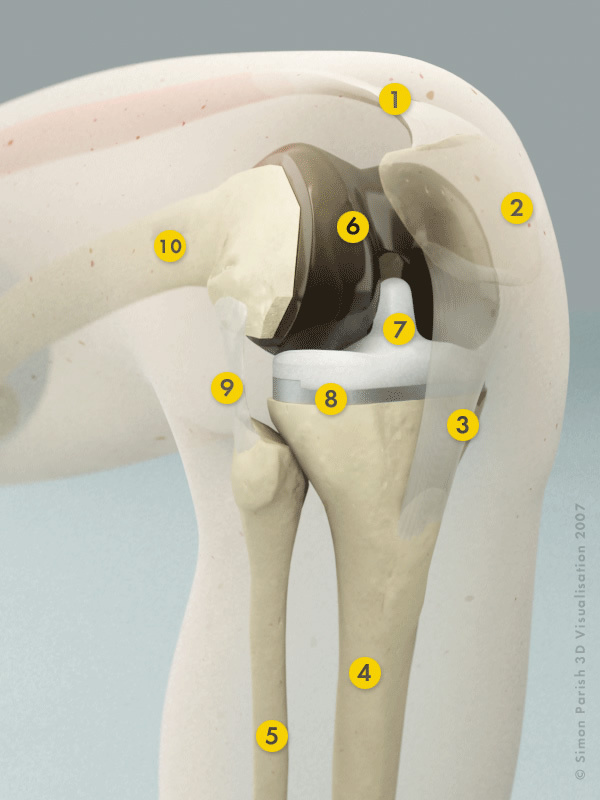 The surgeon should choose the most appropriate type of knee replacement for each patient. Because of its anatomy, most of the weight is borne through the medial (inner) compartment of the knee. As a result, the articular cartilage on the inner side and the medial meniscus tend to wear more quickly than on the lateral side. Consequently, the knee tends to become ‘bowed’ and even more weight is borne through the medial compartment. In time it is likely that most patients will have progression of their arthritis to the other compartments – the lateral and patello-femoral (kneecap joint). However patients who have arthritis confined to the medial compartment, and whose symptoms are uncontrolled with non-operative treatment, may be suitable for an operation to replace only this part of the knee. 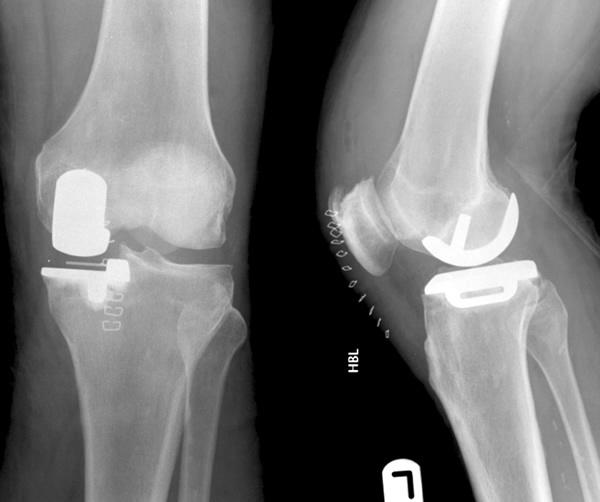 Replacement of only one compartment of the knee is termed a unicompartmental knee replacement. In some cases, arthritis is confined to either the patello-femoral (kneecap) or lateral part of the knee. 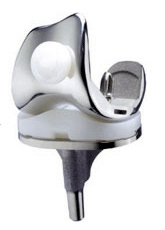 Unicompartmental replacement of these parts of the knee is also possible but is performed far less frequently than replacement of the medial compartment. The results are less predictable. Note: The long term survival of a unicompartmental knee replacement is as good as that of a total knee replacement. Knee replacement surgery involves an inpatient stay of 4-5 days; the patient will generally be admitted the day before the operation. The consultant and anaesthetist will see the patient prior to surgery and the knee undergoing the replacement will be marked. Most knee replacements are performed under a spinal anaesthetic (where the patient is awake but normally sedated), but occasionally a general anaesthetic is used. The damaged bottom end of the femur is shaped so that a metal femoral component can be attached; the top end of the tibia is removed and replaced with a metal tibial component; a plastic liner is inserted between the two. If necessary the back surface of the patella is also replaced. At the end of the operation a drain may be inserted into the knee joint to draw off excess blood. A dressing is applied to the wound and the knee will be wrapped in a crepe bandage. Foot pumps, elastic stockings and occasionally an injection to thin the blood are used to lower the risk of blood clots forming in the legs. Post-operative pain is normal after a knee replacement. It can be controlled by many methods, from pain pumps (Patient Controlled Analgesia, PCA) to simple tablets, and usually lessens dramatically after the first 2-3 days. The pain of arthritis usually disappears within a day or two of surgery. Blood tests and X-rays will be taken in the early post-operative period to ensure that blood levels have not substantially changed and that the knee replacement is in a satisfactory position. The physiotherapists will assist patients in mobilising after the operation and will supervise an exercise programme. It is extremely important that patients follow this exercise programme and take the necessary precautions with their new knee. The majority of patients undergoing knee replacement do not experience any complications. In fact 95-98% of patients are extremely happy with their knee replacement and report that it has given them back their life. However no operation can guarantee success. The risk of infection after knee replacement is about 1-2%. The majority of infections are superficial and require nothing more than antibiotics. Occasionally, however, further surgery is required to deal with infection, and rarely the knee replacement needs to be removed until the infection is under control. Antibiotics are used in every knee replacement and the operation is performed under sterile conditions. Blood clots can form in the veins (DVT), break off and travel around the bloodstream and lodge in the lungs (PE). This can be life threatening, but the risk is very low. Measures that are taken to reduce the risk of DVT and PE are the use of foot pumps and elastic stockings, blood thinning injections and early mobilisation. Some people form excessive scar tissue after total knee replacement. This reduces the amount of bend they can achieve with their new knee. Occasionally (less than 5% of cases) a manipulation under anaesthetic is required to break down scar tissue and allow the patient to bend their knee further. (The average degree of bend after rehabilitation is 100º – 120º). Occasionally one of the nerves supplying the leg is stretched and does not function properly for a period of time. The most common effect of this is to cause a foot drop. Over 90% of these nerve injuries recover on their own without the need for further surgery. The small skin nerves are always damaged by the incision; this causes a small area of numbness on the outside of the knee which slowly reduces in size with time. Very occasionally the collateral ligaments or the patellar tendon are damaged. 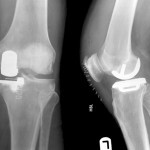 Such damage is usually identified at the time of the operation and dealt with appropriately; but a period of time in a knee brace post-operatively may be required. Not a complication as such, but approximately one third of patients are unable to kneel after their knee replacement; one third have difficulty in doing so and the other third have little or no problem with kneeling.